Besides the commands on the Layers panel in Photoshop Elements, you have two layer menus — the Layer menu and the Select menu, both of which you can find on the main menu bar at the top of the application window (top of the screen on the Mac). 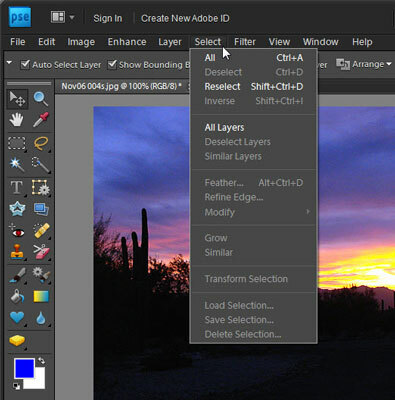 The Layer menu in Photoshop Elements. Delete Linked Layers and Delete Hidden Layers: These commands delete only those layers that have been linked or hidden from display on the Layers panel. Layer Style: These commands manage the styles, or special effects, you apply to your layers. Arrange: Enables you to shuffle your layer stacking order with commands, such as Bring to Front and Send to Back. Reverse switches the order of your layers if you have two or more layers selected. Create Clipping Mask: The Create Clipping Mask command creates a clipping group, in which a group of layers is constrained to the boundaries of a base layer. Type: The commands in the Type submenu control the display of type layers. Rename Layer: Enables you to give a layer a new name. You can also simply double-click the name on the Layers panel. Simplify Layer: This command converts a type layer, shape layer, or fill layer into a regular image layer. Briefly, a shape layer contains a vector object, and a fill layer contains a solid color, a gradient, or a pattern. Merge and Flatten: The various merge and flatten commands combine multiple layers into a single layer or, in the case of flattening, combine all your layers into a single background. Panel Options: You can select display options and choose to use a layer mask on your adjustment layers. Leave this option selected. 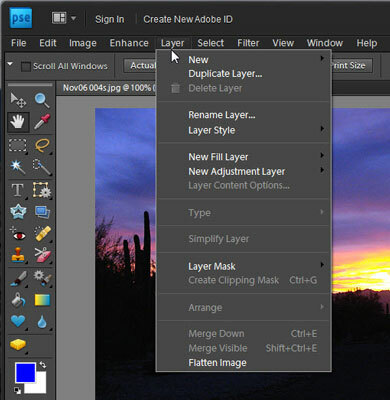 The Layers panel menu in Photoshop Elements. Select All Layers: Want to quickly get everything in your file? Choose Select→All Layers. Select Layers of Similar Type: This command is helpful if you have different types of layers in your document, such as regular layers, type layers, shape layers, and adjustment layers, and you want to select just one type. Select one of your layers and then choose Select→Similar Layers. Deselect All Layers: Choose Select→Deselect Layers. The Select menu in Photoshop Elements.